2 videos this week covering how to install an RS485 adapter to your PC and tehn control your spindle. I split it into 2 seperate videos so that viewers can watch the relevant version without the distraction of irrelevant information relating to another control system. It should make viewing easier. Whether you are intersted in Mach3 or UCCNC just watch the appropiate video for your control software. Even if you don't run these control systems watching will give an insight into what RS485 is and how it is used. The plugin used is available from this website. It has most of the information required to make the plug in work but please watch the video to the end as there is an extra step I did to make the plugin work which is not mentioned in the documentation. Without it the plugin won't work. This is quite an old plugin and it should be very stable. The development thread for the plugin can be seen here. Subscribe to the development thread for new plugin versions as they are released. The plugin file contains a text document giving instruction on changes you needed to make to the VFD configuration as well as UCCNC. It requires only 2 wires and these need to be a twisted pair. Feel free to use a screened cable but make sure there are 2 wires in the cable and use them for communication. Ground the shield at the VFD end only and do not connect the other end of the shield. For both Mach3 and UCCNC the VFD programming was the same. I had a bit of trouble with the first adapter I purchased with it failing to change the speed of the VFD intermittently and seemed to run slow on startup with the UCCNC plugin. When i got the new one I opened up both RS485 adapters and I noticed 2 things about the first adapter I have purchased. 1st the metal case of the USB plug was not soldered to the circuit board. Not a problem as far as the operation of the adapter goes but mechanically it will cause premature failure of the device as it puts strain on the USB connectors pins. It also gives a clue as to the quality of the build. 2nd I noticed that the USB to serial IC is unlabeled and it is not because the name has been scratched off as is sometimes done to hide a critical IC's identity. I suspect it is a copy of the Prolific 2303 chip and was not working correctly with the drivers. The utility on the prolific website identified it as a PL 2303 series chip so maybe it is genuine but I find it hard to believe they wouldn't put their name on it. This IC is also a well known target of counterfiet though the Prolific drivers aren't meant to work with it at all. The FDTI chipset maker is also a target for chipset copying and thier latest drivers won't work with a counterfiet chipset. Both use the Max485 line driver IC for output to the VFD which converts RS232 to RS485. I don't know if the adapter is counterfiet,faulty or something else but it may be safer to use an adapter with a CH340 chipset as these don't seem to be copied by anyone and so the drivers should work with the plugins. The prolific and Ch340 adapters look the same and cost the same so its a toss up which one to get. The Le royaume d'éole plugin documentation uses the prolific version of the adapter so either should work ok. If you are looking for an adapter try the link below. By purchasing a product using the link provided, you help support my channel. The link will take you to search results for the RS485 adapters and you can select the type you want to use. You are not restricted to the type or style of adapter shown here but if you are in anyway unsure of what to buy then get one that the same as shown it the video. at about $2 to $3 delivered you can't go far wrong though it is an inconvenience having to wait for it to be delivered. would you post the list that you were working from? i bought one of these a year ago, but couldn't get it to work. I have updated the page and added the wiring diagram and the setting changes needed to the VFD. 1st, thansk for all this, great info as I'm on the lookou to swap my PC7518 to a Huanyang VFD W-3 or 4Kw spindle ! Anyway, I'm writting to you as it seem you link to buy this "better" The CH340 adapter is not leeding me to it ?!? It's leeding to Ebay for zillion other "cheepo" type ! May I ask where you bought your or a link.....fo I may to help support my channel. I ended up buying mine from a New Zealand based auction site like Ebay because I wanted to get on with the job It has the CH340G chipset in it and I suspect that the seller bought them off Ebay in the first place for resale in this country. Pretty much all the adapters should work but the closest I found is the one below which uses the same CH340G chipset but is lightly different circuit board. It might be a more updated circuit. They are all cheap adapters at less than $2USD delivered. thanks for your time to this reply, much appreciated ! the cable for the adapter RS485 must be parallel normal or twisted. Do you think this same setup can be used on ShopBot spindle controllers? I'm needing to replace my USB RS485, the current model is over $100 on Amazon, seems this might offer a more affordable solution. I'm not familiar with the Shopbot so can't really say. Thanks for the response. The spindle I have is a 1.7kw Yaskawa Drive spindle. The USB-rs485 device that came with the machine is a Delta - IFD6500 USB/RS-485 Communication Converter. I think my device works but my 2-conductor shielded wire is missing and i can't determine which pins are used on the RJ45 jack that goes into the IFD6500. Hello could you help me please i want to get this to control my 3020T cnc spindle speed with mach3 , im clueless with electronics .Where would i connect the 2 wires on in my control box .Ive added a video of my control box on youtube below. This type of motor cannot be connected to an RS485 adapter. For this type of setup you need to use PWM (Pulse Width Modulation)to control speed and a relay to turn it on and off. It doesn't look like your breakout board has provision for either of these so you will need to add your own. Unfortunately I cannot offer you more help than this as I am not familiar with your machine or its control system. If you are not confident with electronics and do not understand exactly what you are doing then it would be wise to avoid an upgrade of this nature until you find someone local who can help you with this. Other than the programming in Mach3 nothing else will apply to your setup thought the principle is the same. You Spindle has no programming unlike the VFD unit i have. Sorry that I can't help any more than this. The box that has the spindle speed showing on it is a VFD drive and will not work with your spindle. The VDF drive is for 3 phase motors while your spindle is a DC motor. You buy the VFD and spindle as a matching set. Unless you are upgrading your machine to something bigger I seriously doubt that the machine could handle a full sized spindle which will be much larger and 3 to 4 times heavier than what you currently have. I'm not trying to discourage you and the best way to learn is to do. I encourage you to persue your upgrade with the help of someone local especially the spindle on / off which would be the easiest to do and the most useful. The problem is I am not in a position to assist with your desired upgrade. A pity really because I think I would enjoy doing it as a hands on project if you lived locally just for the fun of it. Trying to do this remotely would be a disaster. As for building an entire control system, I do not do that so can't give you a price. The USB port is a replacement for the Parallel port but it may not work with Mach3. 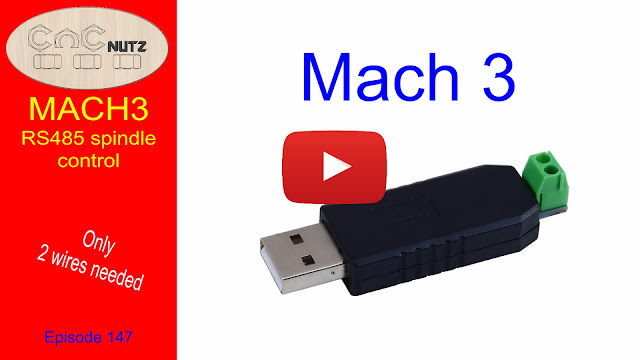 You would need to check with the supplier if the USB port will work with Mach3 and if there is a USB driver for it. It is definately not for RS485 as that is used for VFD drives with 3 phase spindles. The Mach3 RS485 driver I show in the video will only work with a specific range of Huanyang VFD drives which uses a non standard version of communication. The spindle on the machine on Ebay is the same as yours and is a simple DC motor. I watched a quite few videos of people with the 3040 machine and they all manually turn on and adjust the speed so it doesn't look like it is automatic. You will need to ask the seller the capabilities of the machine and its control software but my opinion is that it will be manual like your current machine. That said it mentions "Control unit:triaxial one-piece drive + ring variable power + PWM speed"
triaxial in the description is made up by Google Translate. What a Ring Variable Pawer Supply is is nyones guess. It also mentions "Acceptable software:only CNCUSB"
From what I can tell CNCUSB is a software controller package like Mach3 only more basic so maybe it needs to use this software with the USB port. Again you will need to ask the seller. https://www.youtube.com/watch?v=EuBt6FOlfmk shows the CNCUSB software. The problem with Spec's written in Chinglish is they can mean almost anything. The 6040 machine is very common and it looks like there are many versions of the machine and control box so what you get is anyones guess. I really believe this to be a larger version of what you already have with all manual control. That is my best guess as far as this machine goes. If you would like to support my channel please consider using the affiliate link below to enter Ebay when you make a purchase. I will receive a small commission on any purchase you make at no cost to you. The link simply takes you to the main Ebay page from where you can browse and any purchase as normal. The VFD shown in the Ebay link is a Huanyang VFD and will work with RS485 on Mach3. It is one of the VFD units I considered when I upgraded my machine but I dicided to go for a bigger spindle. The description mentions "(PWM stepless speed regulation)" so maybe it is already setup with speed control. It also mentions "3-axis control box with the power supply + spindle speed regulator" which would imply that speed regulation is built into the control box. Since the box has no speed knob on it I would assume they are using PWM to achieve this. With configuration changes to the VFD it could be made use RS485 as shown in my video though if it already has speed control I wouldn't bother changing it. For what it is worth I chose to use PWM on my machine rather than RS485 and it works just as well. I didn't realize you lived in Europe when I mentioned the Affiliate link in my previous post so it probably wouldn't work for you as it is for the USA Ebay site. I live in New Zealand so I use the USA site. Here is one for Ebay UK if you wish to support my channel at no cost to yourself but no problem if you would rather not. I am always happy to help where i can and donation is not necessary though it is appreciated. The easiest way to contact me is through email using the contact form on the website. says it has '' PWM stepless speed regulation'' . All 3 axis work fine and i can switch on manually the spindle and turn manual the dial.I ve contacted the seller and they they the setting are correct but cannot get the PWM speed and on off in mach3 .Any idea would be grateful , or any idea to maybe manually find all the correct ports and pin .Because i just think the spindle settings are wrong. While I believe the spindle is PWM ontrolled as it is the only efficient way of regulating it's speed I don't think that the spindle is under the control of Mach3 or that there is any provision for it. Trace all the wires running from the spindle power supply to the board that connects to the Mach3 parallel port. I would expect 5 wires. 3 for the PWM control though it might be done with 2 at a pinch and 2 from the relay in the break out board to the Spindle ower supply. the spindle power supply / control will have the spindle wires going to it as well as the spindle on / off switch and the variable resistor for setting the speed on the front panel. I'd also like to run the mach3 spindle with rs 485 but I do not know where to put my hands in the inverter. Could it help me? the rs module with ch340 arduino is there or already at home. The phot below shows the terminals are on the top row 6 & 7th from the left if yours is the same. This is the best I can do to help as I do not have an E100. I have the exact setup you have, except for the water cooled spindle. I just got it working with the rs485 usb adapter. It turns on and adjust speed fine. MDI and put in s10000 again. Any idead what I'm missing ? The setup is behaving the same as mine. The first time you use the spindle after turning it off you have to give it a speed before it will work. The same happens when using PWM as well. This isn't a problem if you are runnig a Gcode file as it should have the S10000 in it but it is a pain if you are trying to do something manual. I did have a look to see if there was a solution but I haven't come up with one yet. It is probably a safety thing to stop the spindle starting when it is turned on. I just got my spindle running on the RS485 adaptor and your video did the trick making it easy. Also, people who sell thus don’t give you the driver or tell you where to get it. Thanks for all your help. One issue I have is that I can only get 22,100 rpms out of me HY running it with the adapter. When I run just the VFD, I get the full 24,000 rpms. Any thoughts or suggestions on this? HI THANKS FOR THE VIDEO AND DRIVER LINKS. i DO HAVE AN ISSUE WHEN STARTING MACH3 AN ERROR SCREEN POPS UP DEFECTIVE VFD PLUGIN, BUT SPINDLE TURNS. THE ISSUE IS WHEN RUNNING IN MDI SCREEN WITH ARROW KEYS SPINDLE RUN AT VERIOUS SPEEDS. SO WHEN I START AT 10000 RPM AND GO UP FROM THERE IT WILL GO THROUGH 11000, 12000,AND SO ON BUT THEN WILL DROP RPMS BACK TO A LOWER RPM WHILE SILL PUSH UP ARROW. WHAT I AM TRYING TO SAY IS THE RPMS DO NOT GO UP SEQUENTIALLY. ANY IDEAS? On the website of the developer of the plugin he has some errors listed and i am reviving one, the error i get is (unable to read value) i have done what he describes to do and i continue to get the same error. I am using the HY VFD with a 2.2KW spindle. I have set all the vfd settings as directed. It is a working state prior to giving this set up a go. something i noticed is i purchused the CH340T chip and not the 340G. Will this cause communication issues? like the issue i am having. I purchased the CH340T adapter of amazon for $6.99 not ebay. link below. I figured the extra 4 bucks is worth not having to wait weeks on in. The one that comes from china and the one CNC NUTS is using is this G version not the T. I did a little digging and it appears the T version chip might be configured a little different so this is why i ask. My computer reads the chip just fine, it shows as COM4. But when i go to configure the plug in in mach it gives me the error unable to read values. One thing i do not currently have is the shielded twisted cable. Would this have effect on establishing communication between VFD and mach? I did use a drill and twisted two wires together, i am not sure if that qualifys as a twisted pair or not. I have shielded twisted pair wire on order. Many people use the T version adapter so no problem there. Twisting the wire should be fine but shielded won't hurt. Have you tried spindle talker to test the adapter and VFD. That will test the setup and help diagnose the problem. Thank you for the thorough explanation on your video. I have a Huanyang VFD 1.5kw, did all settings as per your indications and works perfectly. Just wondering can I go lower than 6000 rpm on the min ???? How about 100 or 200?? Hey there. I know your are using a HY Vfd but for my spindle I have a ENC Vfd which I believe is pretty much the same as the HY. Any ideas If this will work with it? The HY VFD does not use standard MODBUS protocol so the plugin will probably not work for your VFD unless they use the same flavour of MODBUS. That said the adpter costs about $2 on EBAY if your happy to wait, so what have you got to loose? There may also be other plugins that will support your VFD.